CeDur synthetic Cedar shakes offer a beautiful, natural, and classic look paired with unmatched durability and safety that lasts. 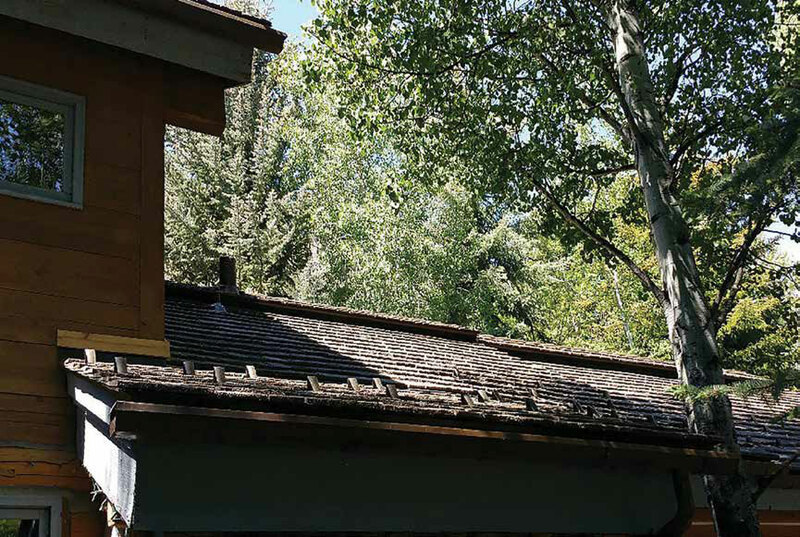 SCOTT MILEY ROOFING OFFERS PRODUCTS AND SERVICES TAILORED TO THE WOOD RIVER VALLEY, AND IT COMMITS TO SERVING THE COMMUNITY, AS WELL AS ITS CUSTOMERS. Local businesses are the heart and soul of the community. These businesses are there when you need them. They have strong loyalties to the people they serve, and they are the people who keep our communities strong. An example is Scott Miley Roofing, who has been serving the Wood River Valley since 1992 from Hailey with the highest level of service and best products available nationally. Through the years it has expanded by word-of-mouth recommendations and has adapted its services and products to better serve the local market. 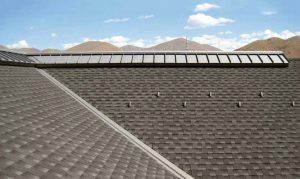 Asphalt roofing shingles are a popular alternative to synthetic wood and metal roofing. 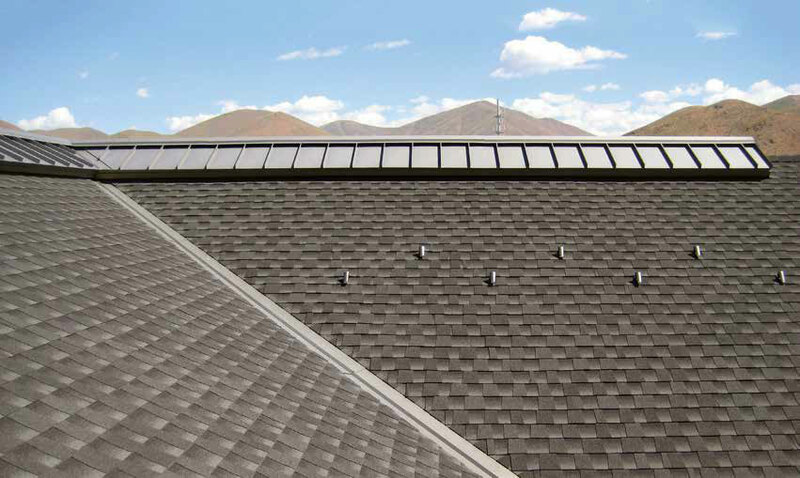 These dimensional shingles are dual layered and provide a thicker and richer appearance on the roof. It’s one of those universal things that no one thinks about their roof until they acutely need assistance. With a call, Scott Miley Roofing offers inspections and estimates for roof replacements and repairs. Scott Miley is a licensed contractor and certified professional through the National Association of Home Builders who has deep knowledge and experience in home construction and how roofs integrate with the rest of the home’s construction. Miley and his staff of 17 employees, in addition to new construction and repairs, work on flat roofs, replace roofs, add skylights, and offer water proofing. Customers can count on this local business for more than roofing. 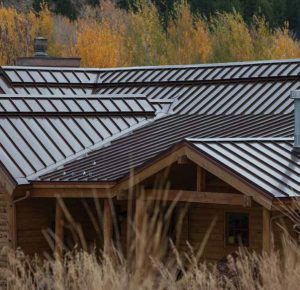 In addition to roofing, Scott Miley Roofing provides seamless custom copper rain gutters, sheet metal fabrication, and custom fireplace caps. Other specialties are metal siding, where bending and fitting are done on-site with specialized equipment, and waterproof exterior cladding. 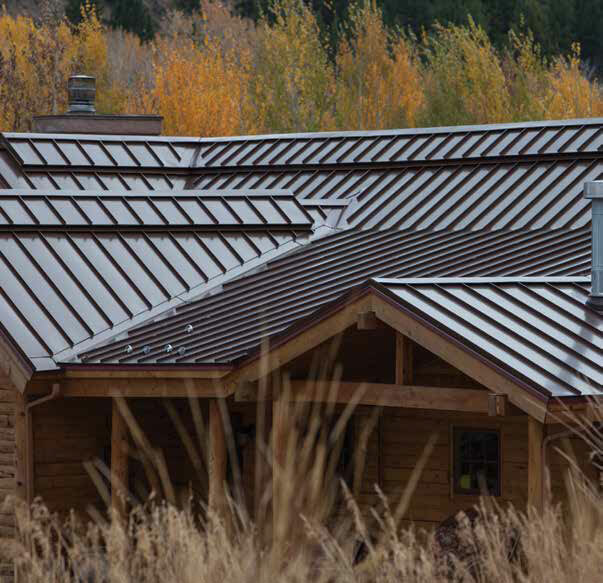 This standing seam metal roof was custom designed and each separate panel fabricated by Scott Miley Roofing. Sadly, severe wildfires are another well-demonstrated concern when selecting and replacing roofing, as experts say there are two things homeowners can do to protect themselves in the event of a wildfire, clearing brush from around the home and having the right roof. Scott Miley Roofing carries a variety of products to meet Class A ratings, including slate, composites, asphalt shingles, and metal, and they are certified installers for CeDUR, GAF, and DaVinci, which have the texture, variation, and colors that rival wood in appearance, plus a Class A fire rating and high wind resistance. 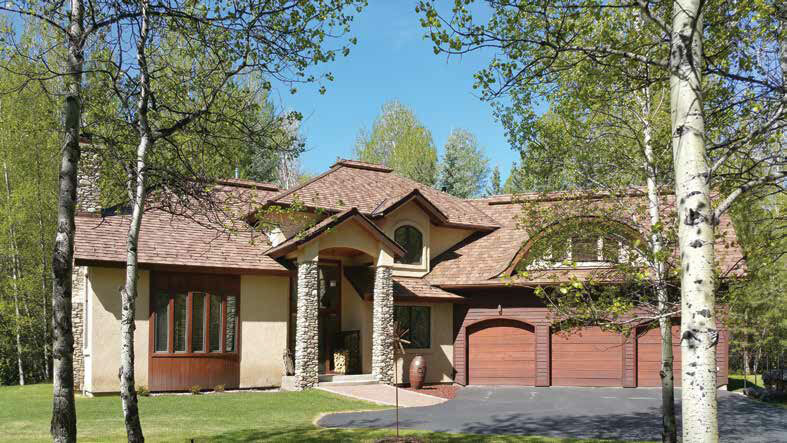 This DaVinci Roofscapes Multi-Width Shake roof adds texture and interest to this Wood River Valley home exterior while offering superior fire protection. Local businesses continually give back to the community. They employ local people, and they back community service groups and non-profit organizations to support schools, scholarships, fundraisers, and people in need. It’s local businesspeople who often organize the events that draw people together like parades, races, community beautification, and celebrations. Money spent locally is likely to be spent again locally—it’s the multiplier effect economists write about. The owners and employees of a local business will in turn spend locally and support other local businesses. This means there is a strong base of local businesses in the community to meet everyone’s needs, and local businesses offer the character and charm that keep communities distinct and special. Exemplifying this, Scott Miley has been selected for the Volunteer of the Year award, and he continues to serve as a Hailey volunteer firefighter. The company donates salvaged material to the Building Thrift to benefit the Wood River Trust, and do what they can for other local non-profits. By buying locally, everyone benefits. Local businesses know responsive service grows loyalty, and they can share an extensive body of local knowledge with their customers. Trading locally builds stronger communities, and everyone profits from that. FOR MORE INFORMATION CALL SCOTT MILEY ROOFING AT 207.788.5362 OR VISIT SCOTTMILEYROOFING.COM.